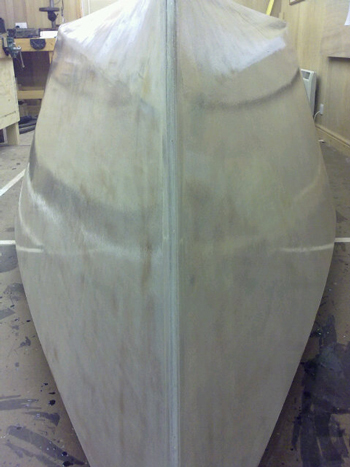 February saw the whole hull sanded back to a sensible base from which to recoat. 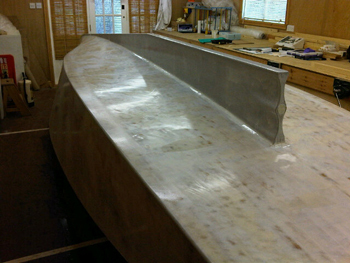 Before starting the recoat I washed the hull with clean water then wiped it several times with alcohol. Apparently this is the only way to minimise fisheye; remove all possible surface contaminants immediately prior to coating. The next coat was just on the hull side and no fisheye! However, I wasn't happy with the underlying surface finish so decided to sand back again. The problem with sanding is you can easily take off more than you put on. So I felt building up was the order of the day but I had been too conservative in the prior sand. More washing and alcohol rubbing and then the next coat. Reverting back to the slow hardener and warming the epoxy, so that its viscosity drops, allows the epoxy to float more easily and the improvement is clear to see. Finally I've lightly sanded the hull all over using 280 grit which is real progress from the 60 and 80 grit I had needed to use on the earlier poor surface. 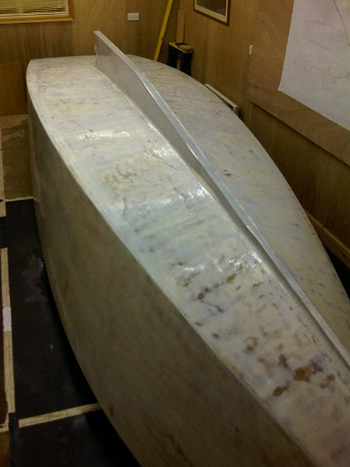 Next month will hopefully see the final coat, possibly two coats, before planning the turning over event.